noHold, developer of the most interactive and diagnostic Virtual Agent technology, has the ability to embed a Virtual Agent directly into social media platforms, Facebook integration for ViewSonic serves as the first example. As social media increasingly becomes a hub for customer interaction and support, noHold aims to help businesses cover these channels with Virtual Agent implementations. With a few simple lines of code, the same Virtual Agent that runs on a company website can assist end-users within their favorite mode of social media, such as Facebook. This provides end-users with an extra layer of interactivity and support, without the time needed to implement a second Virtual Agent. 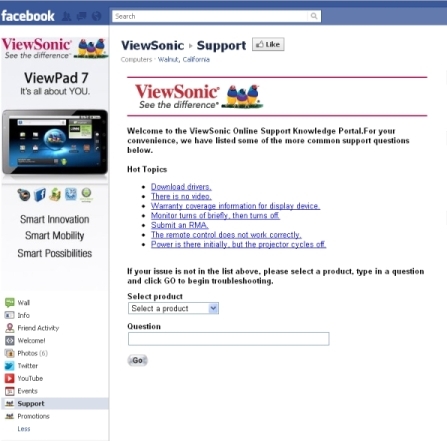 A Virtual Agent on Facebook also allows for another channel to analyze metrics. Wired Magazine estimates that there are close to 500 million users on Facebook, who collectively spend more than 3 billion hours on the site per day. With such a vast audience, extreme value can be found in understanding the types of questions that are being asked through this channel. noHold also has the ability to separate these statistics from the original Virtual Agent, ensuring the ability to track statistics independently from channel to channel. Facebook integration is another testament to noHold’s Virtual Agents being among the most flexible in the industry. With the current ability to integrate with CRMs, live-chats, and social forums, adding the ability to directly connect with Facebook users is just another part of noHold’s continued quest to improve customer satisfaction while reducing support costs. “Since the very beginning, noHold has been all about empowering people to get the information they need, when they need it, and on their own terms. We share this goal with Facebook, so being able to integrate with their platform is a natural result of our strategy”.